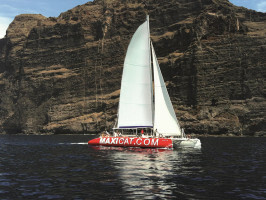 Sail on the Atlantic onboard a luxurious catamaran and take in sensational views of the rugged coastline of Southern Tenerife. If you're lucky you may even get to see whales or dolphins, a common sight in these waters. Relax in the sun with a refreshing drink in your hand or cool down with a dip in the sea. However you decide to spend your day, you are sure to have one to remember! 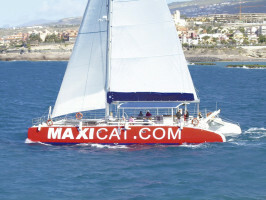 Board the Maxicat and receive a warm welcome from the friendly crew before setting sail for an exciting, comfortable and informative journey upon the Atlantic. 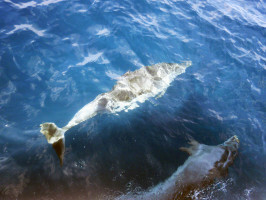 The trained guides will help you to spot the incredible variety of sea mammals inhabiting the waters around Tenerife. 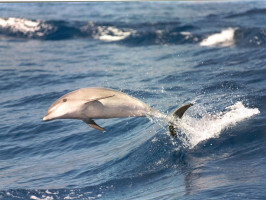 Common bottlenose dolphins and pilot whales are just two of the 28 species that make these waters their natural habitat. After spending time in the company of these amazing animals we'll continue sailing along the south coast and depending on the excursion, head for the breath-taking cliffs at Los Gigantes, where you can relax on the spacious sundecks or opt for a swim and a snorkel in the pristine waters of the Atlantic Ocean. You will have the chance to enjoy a different view of this spectacular coast with its sophisticated resorts, volcanic beaches and secluded coves, as we sail back down to Puerto Colon, where the voyage will come to an end. An unforgettable day out for all the family. The 3 hour cruise includes fruit and a sandwich. The 5 hour cruise includes a full buffet, beer, wine and soft drinks.